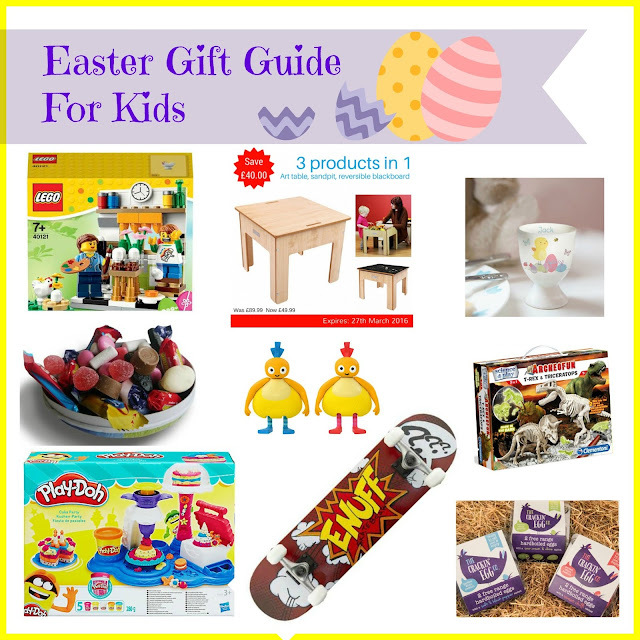 Entertaining Elliot: Easter Gift Guide for Kids + Skateboard giveaway! It doesn't seem 5 minutes since Mother's Day but Easter is just around the corner. Whether you're a fan of chocolate eggs, or prefer to give presents at Easter, read on for some fab gift ideas with all budgets covered. And if you fancy winning the skateboard that features in this gift guide, see below. - Lego Painting Easter Eggs, exclusive to Tesco (£6.99) - You can pick up this limited edition Lego set from Tesco this Easter. It has been created by Lego as a healthy alternative to chocolate eggs and is bound to keep the children busy whilst stimulating their imagination. - Little Helper 3 in 1 Table (£49.99 - This little table is actually 3 products in 1 which makes it a great buy. Perfect for pre-schoolers it is an art table, sandpit and reversible blackboard. On offer until 27th March! - Born Gifted Personalised Eggcup (£8.99) - Kids of all ages love boiled eggs, so why not treat them to one of these gorgeous ceramic egg cups for Easter. The cups can be personalised with names up to 12 characters too. - Scandi Sweetie Eggs from Scandikitchen (£8.95) - For an alternative to chocolate Easter eggs, why not give one of these lovely eggs from Scandikitchen. The shells are made from pretty papier mache and filled with yummy pick n mix sweets such as fruity fish and liquorice. - Twirlywoos Chickedy & Chick Character Pack (£4.99) - These cute little figures will help children develop fine motor skills and encourage their imagination. - Archeofun T-Rex & Triceratops Kit (£14.99) - One for the budding paleontologists, you can dig into the blocks of earth to discover the fossils which can then be put together to make dinosaur skeletons. They glow in the dark too! If you fancy winning your very own Enuff Pow Complete Skateboard from Skates.co.uk then follow the instructions on the Rafflecopter widget below. Good luck! I would give it to my son - it would be his first skateboard. My son, as he really wants one. I'd gift it to my nephew! His birthday is coming up soon! I would give this to my youngest daughter as my older one already has one and shes always asking for one too. My son, Sebastian would love it!!! my youngest daughter, she loves to be outdoors! MY son for his birthday! To my skateboard loving daughter! my youngest daughter, she has ben after a 'cakeboard' for a while, finally worked out what she meant! I would give the skateboard to our youngest if I got lucky and won. I'd give it to my Nephew who is just about the right age. I'd give it to my step son. He'd love it. I'd give it to my 3 year old daughter. I think she'd like it. To my little boy- he's very taken with them! my grandaugther, she would love it! My daughter, she loves anything with wheels! :) happy Easter! My daughter because she has been asking for one. I'd give it to my daughter who has been asking for a skateboard for ages. My son Joseph is skateboard crazy! From Julie McLaren. I would give it to my niece as she has been wanting one for ages! My little sister. She's such a tomboy! My nephew and niece would have to share it. My step daughter. She would love it!